Historical records and archaeological evidence are conveniently denied, but strategically manipulated and suppressed by Communist historians in India. They vigorously preach Aryan invasion theory despite clinching archaeological, archaeozoological and palaeoanthropological evidence. They vehemently deny palaeohydrological and palaeoclimatic evidence on Sarasvati river. But the Left historians have always joined hands with Church lobbies in India for transforming myth into history. The recent evidence of this Communist–Church federation is at Pattanam, a site in Ernakulum district of Kerala. The book titled Pattanam: Constructs, Contexts and Interventions by Dr B. S. Hari Shankar was released on March 17, 2017 at Kozhikkode in Kerala by Professor M. G. S. Narayanan, former ICHR chairman. According to Professor M. G. S. Narayanan eminent historian, Kerala Council for Historical Research (KCHR) is a Marxist research council. Professor Narayanan made this observation when he was inaugurating the release of this book published by Bharatheeya Vichara Kendram. Dr M. G. S. Narayanan charged that the KCHR was organised by the CPM, consisting of historians who followed the dictates and agenda of the party. They kept away the Archaeological Survey of India and Indian universities while initiating the Pattanam excavations under the Muziris Heritage Project. The KCHR aimed to establish under manufactured and deceptive archaeological evidence that Pattanam was ancient Muziris (Muchiri) of the Cheras. The project was also launched for protecting the personal gains of CPM leaders Dr T. M. Thomas Issac, current finance minister in CPM government in Kerala and M. A. Baby, polit bureau member. There was no transparent archaeological research at Pattanam under KCHR. Earlier, stone beads were identified at Pattanam following heavy rains. It was widely propagated that the site was a port city and an ancient township of the Cheras before launching the excavations. When questions were raised at KCHR regarding claims of a township and port city, they took a retreat from their early contentions and made incredible statements that the structural remains unearthed were carried away by local residents. The KCHR also provides an incredible presentation of a wharf to vindicate their claims of a port city according to M. G. S. Narayanan. Ambiguous and distorted evidence of pottery has been put forward by KCHR. Pattanam was highlighted by KCHR in its National Museum exhibition in 2014 as the third site to unearth terra sigillata pottery in India after Arikamedu and Alagankulam in Tamil Nadu. KCHR has suppressed the fact that terra sigillata has been recovered from Uraiyur, Kanchipuram, Vasavasamudram, Kodumanal, Karur and Sulur in Tamil Nadu and numerous sites in western India, especially Gujarat. Similarly, KCHR contended that rouletted pottery from Pattanam was reported for the first time on west coast. This is another false statement. This pottery has been reported from 124 sites across Bay of Bengal and Arabian Sea. Professor Narayanan said that KCHR also intends to propagate that St Thomas landed in Kerala coast in first century AD to propagate Christianity. There are no archaeological evidence or historical records to substantiate that Apostle Thomas arrived in India. There are some records to vindicate that he arrived in the Afghanistan region. The Pattanam excavations under KCHR is the biggest archaeological duplicity and treachery in the history of Indian historical research in this century. Narayanan said the current book has comprehensively documented and discussed Pattanam excavations using all researched and published material available which the KCHR cannot push aside or ignore. Pattanam excavations were not an accidental episode or a project initiated in understanding the historical past of India’s west coast. Pope Benedict XVI, refused to accept St Thomas myth as history. But following pressure by Syro Malabar Church, Vatican secretariat send letter to Cardinal Mar Varkey Vithayathil in Kerala on November 25, 2006 accepting St Thomas myth as history and initiating activities for establishing it as truth. Pattanam excavations by KCHR comprising Left historians panel started at this time. The Marxist historians led by Professor K. N. Panikkar from JNU who is now chairman of KCHR, manipulated archaeological evidence, manufactured new evidence and spread huge lies to establish that Pattanam had historical relations with Jerusalem, Israel and other countries in West Asia from 1000 BC. The director of Pattanam excavations is Dr P. J. Cherian, a Left and Church historian who did his Ph.D in 1993 from University of Calicut on the topic, The Communist Movement in Travancore: From the Origins to the Uprisings in 1946. For Pattanam excavations, Cherian is supported by University of Rome. The University of Rome Tor Vergata has conferred a three-year research fellowship on P. J. Cherian, Director, Kerala Council for Historical Research and Pattanam excavations as reported by The Hindu on February 16, 2011. Cherian took an interest in archaeology due to directions given by United Board for Christian Higher Education in Asia (UBCHEA) with headquarters in New York as reported by Express News Service on 17-02-2011. The Holy Apostolic Catholic Assyrian Church of the East published on 5 March 2011 Cherian’s statement that recent excavations in Kerala have found evidence of a port city that existed more than 2,000 years ago at a place where Saint Thomas is believed to have landed. P. J. Cherian is executive president of the Association for the Preservation of the Saint Thomas Christian Heritage. 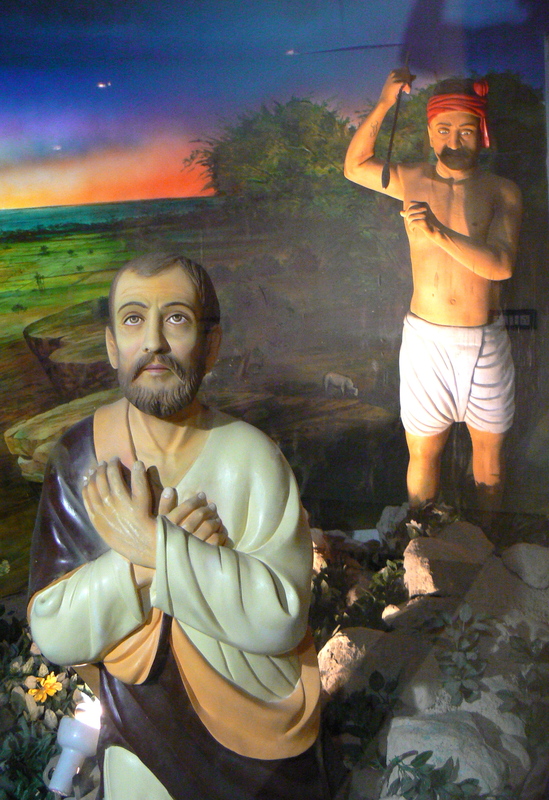 Cherian has presented papers linking St Thomas and Pattanam at the seminars organized by Liturgical Research Centre of Syro Malabar Church in November 2005 at Kochi and July 2011 at Kalyan in Mumbai. Irving R. Finkel, scholar in Biblical studies, inaugurated Khor Rori KCHR Children’s Museum at Pattanam. Few people know the fact that Khor Rori, a place said to be located in Oman said to be associated vaguely to Biblical episodes. The KCHR has huge financial and academic support of a Euro-American lobby outside India. The KCHR has kept away ASI and Indian universities from Pattanam excavations. Recently, the Union Ministry of Home Affairs has cancelled the license of over twenty NGOs in Kerala under Foreign Contribution Regulation Act 2010 with effect from November 1, 2010 which included KCHR. It is also alleged that the KCHR director Dr P. J. Cherian was involved in creation of fake government documents, illegal appointments and financial irregularities worth crores. The Left and pseudo secular historians in India who now work hard at Pattanam for proving the archaeological evidence of Apostle Thomas have simultaneously denied the existence of a Hindu temple at Ayodhya. Veteran archaeologists such as Professor B. B. Lal, late Dr P. Gupta, Y. D. Sharma and K. M. Srivastava presented convincing archaeological evidence of a temple beneath the Babri Masjid at Ayodhya. The team found that the objects were dateable to the period ranging from the 10th through the 12th century AD. Besides Vaishnavite images and that of Shiva–Parvati, the unearthed objects at Ayodhya also included a number of amakalas, i.e., the cogged-wheel type architectural element which crown the bhumi shikharas or spires of subsidiary shrines, as well as the top of the spire or the main shikharas. There were other evidences such as cornices, pillar capitals, mouldings, door jambs with floral patterns precisely showing clinching evidence regarding the existence of a 10th-12th century AD temple complex at the site of Ayodhya. B. B. Lal has noted that the ruins of Ayodhya have a circuit of 4 to 5 kms and rise at places to a height of 10 metres above the ground level. He observed that the Northern Black Polished Ware (NBPW) at the earliest level and continues with several structural phases up to the third century AD. The Left historians such as Professors R. S. Sharma, Romila Thapar, Irfan Habib, D. N. Jha and K. N. Panikkar from Jamia Millia, Delhi, JNU and Aligarh universities denied this archaeological evidence at Ayodhya for their pseudo secular interests. Their research methodology, manufacture of archaeological evidence and communal agenda have all been exposed from Pattanam excavations. » G. P. Srinivasan does historical research and reporting at Srirangam. This entry was posted in ayodhya, christian mythology, pattanam, st. thomas, syrian christians, syro-malabar catholic church and tagged archaeology, ayodhya, christian myth, kerala council for historical research, p.j. cherian, pattanam, st. thomas. Bookmark the permalink.